In this personal development book by Greg McKeown, the author focuses on, as the subtitle states, “the disciplined pursuit of less.” McKeown discusses the importance of cutting out non-essentials to distill the most purposeful, targeted lifestyle, focusing on depth, intensity, and quality of life over broad, unfocused, unproductive living. 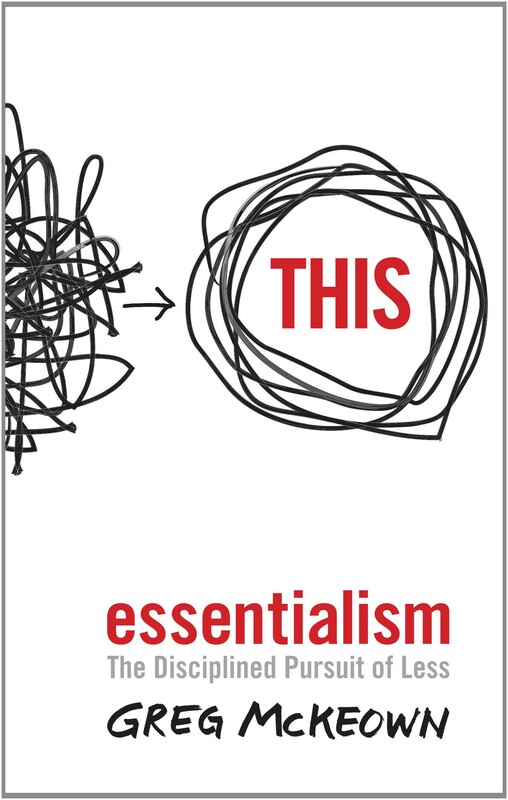 McKeown separates people into two categories: Essentialists and Non-Essentialists, and in each chapter goes through what makes Essentialists different from their Non-Essentialist counterparts. Topics the book covers includes: choice, sleep, discernment, play, saying “no,” small wins, and more. Evaluate requests using a tough criteria: Is this the MOST important thing I should be doing with my time/resources right now? People can respect you MORE for your refusal than less. Give yourself permission to stop trying to do it all, saying yes to everyone, so that you cann make your highest contribution toward what really matters. The Way of the Essentialist: He is driven by the idea that almost everything is noise. Few things are essential. His job is to filter noise to get essence. Live by design, not default. Less, but better. I choose to, not have to. What are the trade offs? Pause to discern what matters. Say no to all but the essentials. Choose carefully, do great work. Feel in control. Joy. The Way of the Nonessentialist: If you don’t prioritize your life, someone else will. Too many choices. Peter Drucker: this age is special not for technology but substantial choices available to the greatest number of people. What am I deeply inspired by? McKeown’s school days: straddled strategy of attempting invest in all at once. Not failing in anything, but not succeeding either. By refusing to choose “not law school,” I had chosen law school — not becauase I actually…wanted to be there, but by default…when we surrender our ability to choose, something,,,will step in to choose for us. learned helplessness: Seligman and Maier’s experiment on dogs showed that over time, dogs stop running away from pain when they think they can’t. Choice is the core of being an Essentialist. Nonessentialists forfeit choice. Getting used to “less but better” may be harder than it sounds. Nonessentialists think almost everything is essential. Essentialists think almost everything is nonessential. CHAPTER 4 Trade-off: Which problem do I want? We must make hard choices for ourselves, or allow others (boss, colleagues, customers) to do it. When you craft a value statement, forget “passion, innovation, leadership, etc” who doesn’t value those things? Focus on what you value MOST. What should you do when those values are at odds? Jim Collins, Good to Great: Peter Drucker said, you can build a great company or great ideas, but not both. Cumulative impact of this small change in thinking can be huge. Paradox: Essentialists explore MORE options than Nonessentialists before committing. Nonessentialists get excited by almost everything, react to everything. If you’re too busy to think, you’re too busy, period. We need space to discern essential few from trivial many. We don’t get space by default but by design. Essentialists create space. Journalism: the lead: contains why, what, when, who. Covers esesential info. Be a journalist of youor own life. Don’t hyper-focus on minor details. See the big picture. Nonessentialists listen in order to say something, get distracted. Essentialists hear what isn’t being said. Keep a journal. People are shockingly forgetful. Review every 90 days or so, but not focusing on the details. Look for patterns/trends. Capture the headline, lead of your day, week, life. Small incremental changes are hard to see in the moment, but over time they accumulate! Keep an eye out for abnormal/unusual details — get a different perspective on the story, fresh light. Ask yourself: What question are you trying to answer? Ask it over and over until you are clear. Stuart Brown: National Institute for Play: Play can significantly improve everything, personal health to relationships. We’re built to play and built through play. Play doesn’t just help us explore what is essential. It IS essential itself. Essentialists see sleep as necesssary for high level contribution. 1 hr of sleep = many hrs of productivity. Sleep is a priority. K Anders Ericsson study on violinists: 1st most important factor separating good from best is deliberate practice. 2nd is sleep. Sleep helps with problem-solving ability. Derek Sivers TED talk: No more Yes. It’s either HELL YEAH! or no. If the answer isn’t a definite yes, it’s a no. Ask: Do I absolutely LOVE this? This can get hard when opportunities come to us. Don’t say yes for an easy reward. Don’t just search for “good career opp” you will have too many options. Ask the 3 questions: passion, talent, world need, and choose from those answers. PART III: ELIMINATE: HOW CAN WE CUT OUT THE TRIVIAL MANY? Don’t just deide what isn’t worth your effort — get rid of those things actively. The question to help you uncover true priorities: Of your list of priorities, what will you say NO to? Essential question: If we could be truly excellent at one thing, what would it be? Interesting exercise from Stanford Business school: evaluate vision and mission statements of nonprofits to see which are LEAST inspiring. It must answer the question: How will we know when we have succeeded? A true essential intent is one that guides your greater sense of purpose, and helps you chart your life’s path. It is hard in the moment to choose what is essential over what is nonessential because we are unclear about the essential = we are defenseless. We also fear social awkwardness. We must learn to say NO resolutley, gracefully. Peter Drucker: art of the graceful no. You don’t have to use the word NO to say no. “I’m flattered you thought of me, but I’m overcommitted” works too. Remember everyone is selling something. (Idea, viewpoint, opinion) in exchange for your time. Don’t be cynical, but be aware of what is being sold to be deliberate about whether or not you buy. Saying NO can mean trading popularity for respect. NO can impact the relationship short-term, but when the annoyance wears off, the respect kicks in. Ex: Steve Job wanted designer Paul Rand to come up with some options for NeXT, but Rand said “I specialize in one option. Take it or leave it.” Earned Job’s respect, and Job hired him. Awkward pause: Don’t be afraid of it. Control it. Let the other guy fill the silence. Yes, what should I deprioritize? : Sometimes you cannot say no. If your boss asks for help with one project, say Yes, and what other project should I deprioritize? Essentialists are comfortable cutting losses. Owning something causes you to value it more highly. Even if it’s not much use to you now. Same goes for activities you are involved in. Reverse pilot: test whether removing something will have negative consequences. Ex: stop doing some presentation, and if no one notices or cares, eliminate it. This is opposite of prototyping: building a model to test if the idea will work, before investing a lot of money up front. A good film editor makes it hard NOT to see what’s important because he eliminates everything but what NEEDS to be there. Editors don’t just say “no,” they also add things: use deliberate subtraction to add life to the story. 2 questions: 1) are you saying what you want to say? 2) Are you saying it as clearly/concisely as possible? Editors must have clear sense of overarching purpose of the work being edited. Make course corrections by coming back to your core purpose. Edit less: you don’t have to change everything. Know when to show restraint. If you don’t set boundaries, there won’t be any. Boundaries are empowering. Don’t take other people’s problems. It doesn’t do them any good. What are your dealbreakers? When do you feel violated? Make a contract with others. Clayton Christensen: The Innovator’s Dilemma If you make an exception once, you may keep making it. Boundaries are like dominoes. One falls down, all falls down. Boundaries can come at a high price. Nonessentialists force execution. Essentialists cut so much out and have a system that execution is almost effortless. Systems make neatness effortless and routine. Life is unexpected, so create a buffer. Nonessentialists assume best case scenario, but things always inevitably come up. Conduct scenario planning: 1) what risks do you faceon this project? 2) worst case scenario? 3) social effects? 4) financial impact? 5) how to reduce risk/strengthen sociail/financial resilience? Identify the thing that holds everything back, and find ways to make it better. Ex: put the slowest hiker at the front of the pack, remove his burdens. That way the group stays together and goes as fast as possible. When we don’t know what we’re really trying to achieve, all change is arbitrary. Identify your “slowest hiker” based on prioritizing your list of obstacles. Adopt minimal viable progrerss: what’s the smallest thing you can do that will be useful and valuable to the overall task? What’s the minimum you can do RIGHT NOW to prepare? Michael Phelps has a mental routine of visualizing the perfect race every day before bed and after waking. For years. His habits take over. Routines make the essential the default position. Charles Duhigg: The Power of Habit the brain can almost completely shut down, which is an advantage, because you can use mental energy for something else. Start small. One step/small changeat a time. CHAPTER 19 Focus: What’s important now? WIN = What’s Important Now? Do you get stuck replaying past mistakes? Multitasking is not the problem, Multifocusing is. Ask: What do I need to do to be able to go to sleep peacefully? Get the future out of your head so that you can focus on what’s important now. Pay attention for your own kairos moments, think about what triggers them. Try to recreate them. We all have a Essentialist and Nonessentialist inside us, which one are you at your core? If you can do only one thing, what would it be? Ready to be a Brilliant Writer? I’ve created The Brilliant Writer Checklist to help you clarify your message, reach more readers, and change the world with your words.